A while back I went to see some of the houses that Dallas architect Stephen Chambers has been working on. I met him and his wife Stephanie at their house in Highland Park, and before we headed out, Stephen showed me his amazing collection of antique tools which fill an entire room of their house. The old tools are so graphically beautiful, I couldn't just shoot a few. It took me an hour to photograph them, and I think I only got a small portion. More calipers. I love the patina on the metals and the sculptural shapes. There must be thousands of old tools and many of them fills the drawers of this flat file storage unit. Undertaker’s screwdriver with beech handle and brass ferrule, English. Stephen says the undertakers probably kept these in their jacket pockets. Some antique protractor T-squares. They look sort of Medieval and torturous. Look at the wonderful antique stove and lawyer's cabinet behind the metal file cabinet. Drawers full of small and large antique hammers for every conceivable job. Antique nickle-plated sewing machine oil can. Nickel-plated! Can you imagine anyone nowadays making a simple tool this beautiful? And I love how specific to its duty each tool is. Antique plumb bobs. Don't you love that name? Antique surveying instrument, micrometers, scales, planes, oil cans. Click on the image to view details. Antique drafting table. On table is a photo of nerve cell regeneration, taken by their son researcher Stuart Chambers, Ph.D. at Sloan Kettering. Antique chisels. When I look at chisels, I can hear the tink-tink-tink sound they make in my head. Now that I've said that, can't you? 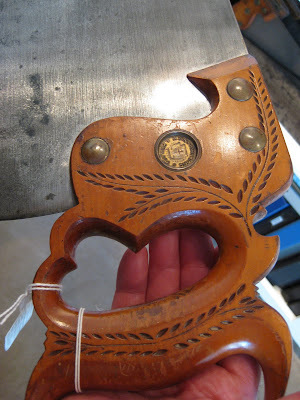 Beautiful antique saws and hand carved handles.